Jolis arômes de fruits blancs et de pêche de vigne, bouche charnue et harmonieuse, allonge fraîche et consistante, belle persistance aromatique. Light herbal oil. Heady and challenging on the nose. Full bodied and round with herby notes. A little chewy, but lots of interest there. Lovely and round, a bit salty or bitter on the finish, lots of interest. 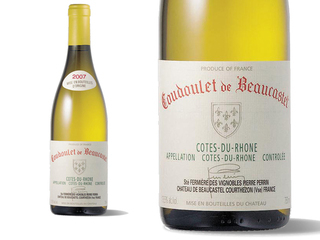 Readers should not overlook the 2007 Cotes du Rhone Coudoulet blanc. Always one of the appellation’s finest white wines, the outstanding 2007 is a blend of equal parts Viognier, Marsanne, and Bourboulenc with a dollop of Clairette. It displays aromas and flavors of tropical fruits, lychee nuts, white peaches, and flowers offered in a deep, medium to full-bodied style with great fruit as well as terrific acidity. Beaucastel and its subsidiary wines marketed under the Perrin et Fils moniker are consistently among the bright shining stars of France. I have been visiting this estate for nearly thirty years, and over that time I have seen all the elements of what makes wines great – an incredible respect for the vineyards, a conscientious, uncompromising work ethic, and extraordinary passion for gentle handling of fruit from their sites. Brothers Jean-Pierre and Francois Perrin seem to be gradually inching closer to retirement as their sons take more and more of a front row seat in the running of this outstanding estate. This is a marvelous portfolio of wines, from the extraordinary values, to the top-end world classics. While one could say this is as traditionally run estate as can be found in western Europe, the Perrins are remarkably flexible if they sense that quality can be improved. Quality rises dramatically with the Perrin et Fils cuvees. The Cotes du Rhone Reserve wines are produced primarily from the estate vineyards at Grand Prebois and Vinsobres, with some purchased fruit from such Cotes du Rhone appellations as St.-Gervais. Marc Perrin, who is responsible for winemaking at Perrin et Fils, seems to go from strength to strength with this line of wines, which includes negociant bottlings as well as some from estate vineyards in Vinsobres.